Living in Wyoming, we’re used to encounters with wildlife, whether in State Parks or in our own backyards. We understand that it can be dangerous to interact with even the cutest animals. This is not always the case with out-of-towners, though, and it’s not unusual to read news stories about park visitors who fail to follow regulations and end up getting themselves hurt or arrested. Or both. If you or a family member has had an encounter with a protected species, it’s easy to run afoul of the local or federal authorities. That’s why it is imperative that you seek out the help of a knowledgeable Wyoming defense lawyer right away. To learn more about how the trial attorneys at Steven Titus & Associates, P.C., can help you, call (307) 257-7800 today. The New York Times recently ran a story on an Oregon man who had several run-ins with law enforcement in the region. The story started with a viral video of the man taunting a bison in the road at Yellowstone National Park. He gestured at the animal, as if he wanted to fight it, and later grunted in its direction as he bent over and balled his fists, intimating that he was intending to charge. At one point the woman filming the video says, “Oh God, no, no — I can’t watch anymore!” But fortunately, the encounter ended when the man ran away and no harm was done to him. By itself, that would have been enough to bring federal charges against the man, but he wasn’t done yet. On the same trip, the man got into a disturbance at a Glacier National Park lodge while arguing with another visitor. He was also arrested for drunk and disorderly conduct at Grand Teton National Park, and cited for driving without a seatbelt while in Yellowstone. That’s a lot of charges for what was supposed to be a vacation to the beautiful State of Wyoming. What Does the Law Say About Interacting with Wildlife? National Park rules state that visitors must “remain at least 100 yards (91 meters) from bears or wolves, and at least 25 yards (23 meters) from all other wildlife.” What visitors to the National Parks may not realize is that park regulations have the force of a federal law. That means violating them is a lot more serious than just breaking a rule. A transgression can be punished by a fine, jail time, or both. When you are on park land, you are subject to all federal laws, the park regulations in particular. 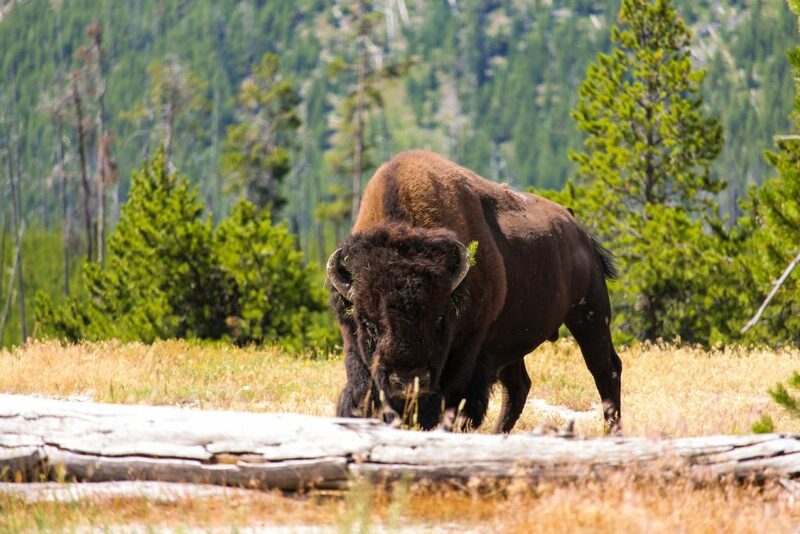 As soon as you cross into Yellowstone or one of the other National Parks, Monuments, or Historical Sites in the area, Wyoming state laws no longer have priority. This is of particular importance when it comes to wildlife, because interactions with wild animals are common in these parts. The regulations concerning wildlife are not exclusive to endangered and threatened species, such as wolves and bears. Even animals that are common in the region (and might be thought of as nuisances) are protected by National Park regulations, including squirrels, raccoons, and birds. What’s the Difference Between Federal and State Crimes? In states like Wyoming, where there is a lot of federally owned or protected land, it can pay to have a good understanding of federal law. When on federal property, whether parkland, national forest, or federal buildings, you are subject to federal laws and regulations. But you don’t have to be in one of those locations to be charged with a federal crime. The Endangered Species Act applies no matter where you are—for example, it’s prohibited to take an endangered animal on your own private property. Other federal crimes, such as bank fraud, insurance fraud, or kidnapping, are illegal no matter what jurisdiction you’re in. This leads to a peculiar situation where it’s possible to be tried for the same crime in both federal and state courts. A relatively minor federal crime, such as harassing wildlife, can have a negative impact on your future if it lands on your criminal record. That’s why it’s important that you mount a full defense against any federal charges. At Steven Titus & Associates, P.C., we understand that every defendant deserves to be professionally represented in federal court. Call a friendly and knowledgeable Gillette criminal defense lawyer today at (307) 257-7800 to schedule a free consultation. Arrested for Dealing Methamphetamine in Wyoming?